We describe two Go programs, Olga and Oleg, developed by a Monte-Carlo approach that is simpler than Bruegmann’s (1993) approach. Our method is based on Abramson (1990). We performed experiments, to assess ideas on (1) progressive pruning, (2) all moves as first heuristic, (3) temperature, (4) simulated annealing, and (5) depth-two tree search within the Monte-Carlo framework. Progressive pruning and the all moves as first heuristic are good speed-up enhancements that do not deteriorate the level of the program too much. Then, using a constant temperature is an adequate and simple heuristic that is about as good as simulated annealing. The depth-two heuristic gives deceptive results at the moment. The results of our Monte-Carlo programs against knowledge-based programs on 9x9 boards are promising. 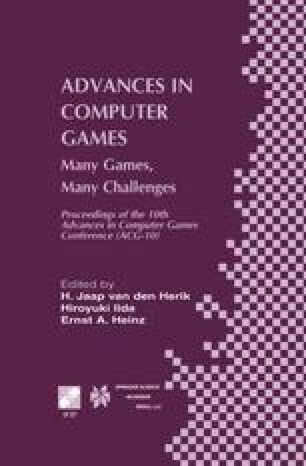 Finally, the ever-increasing power of computers lead us to think that Monte-Carlo approaches are worth considering for computer Go in the future.